So a while back the wonderful Julianne Snow asked me to participate in a blog tour for writers. We were to answer four questions and then tag three other authors at the bottom of the post. I asked Gabino Iglesias, Grant Wamack, and Mike VanKennen. I figure they’re cooler than me, so I’m putting them up front, and then I’ll answer the four questions they’re going to answer next week after that. Click on their pictures to visit their blogs. Gabino Iglesias is a writer, journalist, and book reviewer living in Austin, TX. He’s the author of Gutmouth (Eraserhead Press) and a few other things no one will ever read. His work has appeared in The New York Times, Verbicide, The Rumpus, HTMLGiant, The Magazine of Bizarro Fiction, Z Magazine, Out of the Gutter, Word Riot, Red Fez, and a other print and online venues. Grant Wamack is a writer, rapper, traditional artist, and Navy journalist. He is the author of the bizarro novella Notes from the Guts of a Hippo. He currently lives in Spain where he dances in the streets with beautiful ghosts and dodges bulls. Mike VanKennen is a poet writing for friends’ kitchens who will have on multiple occasions read words to actual people. He has provided some nonsense for a Quirky Love Interest record he’s not sure will ever see the light of day. Full-time college student part-time wage slave with aspirations of pokemon mastery. He has also overcome his fear of writing about himself in the third person with the publishing of this bio. First, I’m getting read to promote my next book, Journey to Abortosphere, which is out on kindle, but hasn’t hit yet in print. It could be described as a bizarro romance tale about a man who loses his first love (a shoehorn), finds unrequited love (first with a boiler, then with a machine that warps space-time) and then finally meets the woman of his dreams. Really, it is just a story about the absurdity of existence . . . and butts. For example, some conspiracy theorists believe the Philly experiment scattered the body parts of sailors across space time. Legs, arms, sometimes souls. But never, ever are there any discussions of butts getting strewn through time. I figure it’s about time we talk about these butts. Where are these butts now? Is there some ancient hieroglyphic evidence of sailor butts in ancient Egypt, perhaps? I guess I should return to my bizarro roots to answer this question. When working in any genre other than bizarro, my bizarro roots make me stand out. There’s always an element of the weird in my work, and that’s been the case before I even knew that what I wrote could be identified as bizarro. When I write bizarro, my work probably differs from others in the genre because it doesn’t always comfortably fit the high concept model that is really popular right now. That can be a good thing and a bad thing. 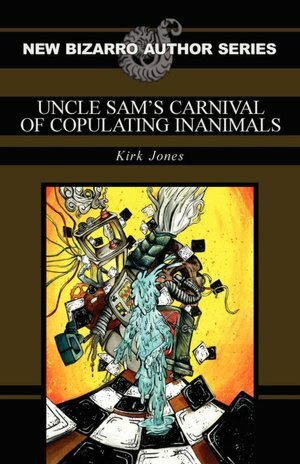 I re-read a review of my first book, Uncle Sam’s Carnival of Copulating Inanimals, tonight. The reviewer described the themes as cluttered, which I can see in retrospect. There’s too much being packed in there. I think it is something all beginning authors contend with. We finally get that chance to publish, so we try to pack it all in. It takes a while to learn how to slow down and address one issue at a time. I let my passions guide me most of the time. Something sparks my interest and I keep diving in. The book I’m revising right now started with a YouTube video clip about the history of FCC regulations. I was intrigued, so I went to the local university library and started digging anything I could up relating to this subject. I branched out and branched out until I had the idea completely formed. Then I started writing. The process I describe above isn’t usually how I work best. I often come up with an idea and then just start writing. Often, if I know the end of my book I’ll stop writing. I’m a storyteller at heart. Once the story is completed it my head, I don’t feel the urge to get it out on paper. So I tease the story along. I usually end up cutting about 1/5 to 1/4 of the work afterwards because the approach I take is a bit sloppy and a lot of cutting is necessary to make the story concise and neat. But the last book I had outlined pretty well. I’m growing more disciplined now that I’ve grown up a bit as a writer. The book I’m working on currently had a mystery element to it, so I had to outline it more carefully than I normally would outline a work. I’m pleased with the results so far. Kirk Jones (k3rk Dʒoʊnz): 1. English Director of Nanny McPhee 2. “Sticky Fingaz,” rap artist and actor who played Blade for the television series 3. Canadian who survived a dive over Niagara Falls . . . only to return and pass upon his second attempt. 4. 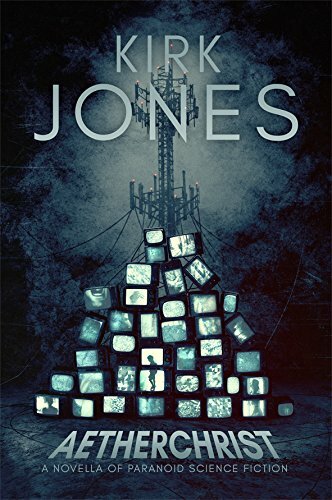 Boring white author of Uncle Sam’s Carnival of Copulating Inanimals (Eraserhead Press, 2010), Journey to Abortosphere (Rooster Republic, 2014), and Die Empty (Atlatl, 2017) who often gets mistaken for the other, arguably more notable, Kirk Jones fellows. 5. Also not Kirk Byron Jones. "A Minor Obstruction in the Piping"